Swiss CNC Lathes capable of machining up to 18" long threads. 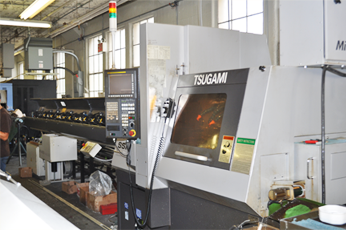 1 TSUGAMI BS-26-MK III PANTHER: 8 AXIS MACHINE WITH 2ND SPINDLE FOR SECONDARY OPERATION FMB TURBO BAR FEED. 2 TSUGAMI BS-12 MK III: HIGH PRECISION WITH 6 AXIS WITH 2ND SPINDLE FOR SECONDARY OPERATIONS WITH A MULTI BAR FEED. 2 TSUGAMI BE-20-V: 6 AXIS WITH FMB TURBO BAR FEED. 1 TSUGAMI SS20: 8 AXIS WITH FMB TURBO BAR FEED.